After showing you all the terrible mess in our attic and spare room it is only fair I share the progress. Now if wanted to wait until it was finished or even just tidy you’d never get to see it so this is what it looks like right now. 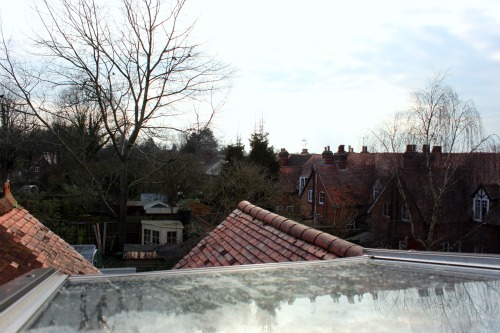 The little velux window faces South over the village which can prove to be a rather distracting view at times. This is the widest shot I can get with my camera. The room is pitched on three sides and the ceiling isn’t much higher than my head. To the left is Mr Kat’s desk which is actually my Dad’s desk which has followed me around from place to place over the years. To the right is my desk which looks over the bannister and stairway. I got the desk and chair from eBay. Although you can’t tell in this picture, the desk is quite scratched and is in need of some kind of attention soon. Aside from the mess and cables I have some faux flowers on my desk. The smaller pot are some fabric pansies in a vintage French honey pot and the larger ones are tulip lights in a Champagne bucket from our wedding. 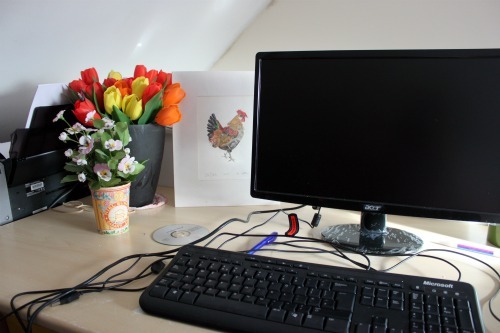 After some excellent advice from Louise at the British Chiropractic Association event I attended I invested in a monitor so I’m not sat hunched over the laptop – such a difference. 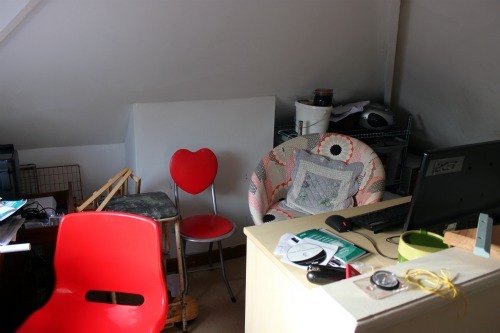 So there you have it, our chilly little attic office. It may not be much but oh my is it good.